The Malinois comes from Belgium where many of the names common to the breed also originate. Flanders, Brabant, Limburg, Liege, and Namur are a few options that come provinces within Belgium. Belgium has Dutch, French, and German as it's three official languages. Aleid, Lex, and Gabriel are a few popular Dutch options. Some French name ideas are Audry, Chanel, and Isabelle. German favorites include Fritz, Katrin, and Klaus. The Malinois has been used in the military and in police works for various tasks including detection of odors, tracking suspects, and search and rescue. US military ranks provide a few dignified name choices such as Major, Captain, and Colonel. The Ultimate Fighting ring is a unique source for strong dog names. Couture, Sylvia, and Cain are some name ideas that come from UFC champions. Some of our pages will contain a subcategory. A subcategory is a slightly more specific grouping than the main topic of the page. For a subcategory, we will include a separated table of names and corresponding descriptions. An example of a subcategory of Red Dog Names would be 'Dog Names Inspired by Red Wines'. 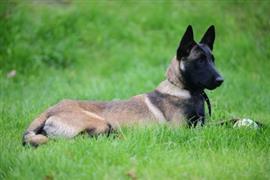 If you have any subcategory ideas for the Malinois Names page, we would love to hear them. Use the form below to submit your ideas.